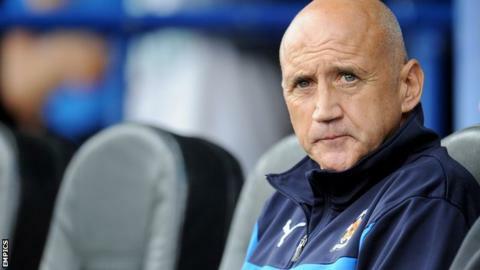 Cambridge United boss Richard Money has said Financial Fair Play rules and low attendances will restrict his ability to recruit players. Under FFP, clubs can spend only 55% of their income on the playing squad. The U's last two crowds have been around 3,000, compared to 6,000 on the opening day of the season, while Money currently has six injuries. "If our income is what it is, there will be no income to spend on players," Money told BBC Radio Cambridgeshire. Cambridge marked their return to the Football League after a nine-year absence with a 1-0 home win over Plymouth, in front of a crowd of 6,000, of which 1,000 were travelling supporters. The two subsequent fixtures at the Abbey Stadium - a 2-1 loss to Morecambe and a 5-0 thrashing of Carlisle - have attracted attendances of 3,100 and 3,500 respectively. "Our first three home attendances are worrying to say the least," said Money. "Five thousand of our own support against Plymouth, but our next attendance only gives us 3,000 supporters. "Where that 2,000 have gone and why they would want to stay away is worrying. "Attendances alone look like they are not going to give us an opportunity to grow the club the way we want. So the club has to grow off the pitch extremely quickly. That's simple mathematics." The U's are currently without six players because of injury and will be forced to call on players from the youth team against Dagenham & Redbridge this Saturday. "We are looking at the loan market. We always look. But getting players of the quality of the ones missing is impossible," said Money. "We look at our own young players and think who are we going to get that's better than them?"